Optical Surfaces Ltd (Kenley, UK), a leading producer of ultra-high precision optics and optical systems, reports on an ongoing program of investment in new staff and facilities following consistent growth in sales over the last 3 years. Dr Aris Kouris, Sales Director commented “Lead by increased international demand for challenging one-off’s and batches of high precision optics from the fundamental physics, astronomy and defence communities in particular we have achieved over 60% growth in the last 3 years. 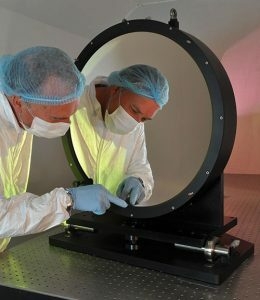 As a customer-focused company we elected to reinvest some of this success into new staff and also enhancing our already comprehensive test facilities with a new 600mm aperture Fizeau interferometer and development of new space for quality assurance”. He added “I would like to take this opportunity to welcome our latest two new trainee optical technicians to Optical Surfaces. Danny Austin, a skilled machine operator, is currently being trained in polishing of large optical flats, windows and lenses. Drawing upon his experience in quality control, Enoch Wilcox has started his training in our optical smoothing team”. For further information on Optical Surfaces Ltd please contact the company on +44-208-668-6126 / sales@optisurf.com.